My great aunt, the lovely Dollie Belle Marlow, was born on July 6, 1896 in Carlinville, Illinois to Anna Belle and Joseph H. Marlow. 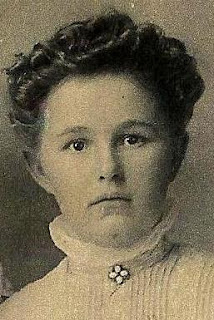 She was the fifth eldest of nine children, including Lena Sarah, Winnifred Ann, Maud Elizabeth, Joseph Robert “Tom”, William Benjamin, George Johnson, Charles Frederick, and Zella Melba. When she was sixteen years old, in November 1912, she came with her family to Lougheed, Alberta, Canada, where her father purchased a C.P.R. farm. Three years later, in 1915, when she was about nineteen years old, she married Carl Max Klinger, known as Max, four years her senior, born in 1892 in Minnesota. He and his family had come to Canada in 1910. His parents having been born in Germany, Max spoke German as well as English. Both Max and Dollie could read and write. Max had his own farm, where he employed others. Their daughter, Ruby Belle Klinger, was born on January 9, 1916, and their son, Arnold Alvin Klinger was born January 23, 1919. Sadly, Dollie Belle, aged twenty-two, died the same day she gave birth to Arnold, reportedly due to influenza, during the influenza epidemic of 1918/1919, rather than of complications of childbirth. She was buried in the Lougheed Cemetery, where the inscription on her headstone reads, “May the heavenly winds blow softly”. 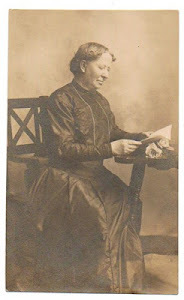 Ruth Peacock, her niece, described her many years later as “a gentle and sensitive lady”. Presumably because Max was without a wife to care for his children, Ruby and Arnold were taken in by Dollie’s parents, Anna Belle and Joseph Marlow, when Arnold was just a few hours old. The children were legally adopted by their grandparents in 1923. Max married Kathleen Armstrong, the sister of Dollie’s sister-in-law Margaret, the wife of her brother, Tom Marlow, before 1923, when his son Lawrence Carl Klinger was born. I must say that I am curious as to why Ruby and Arnold were adopted by their grandparents rather than going to live with their father and his new wife. There are a few missing pieces to this story. Ruby Belle Marlow died of tuberculosis at the age of eleven on October 13, 1927. She was buried in the Lougheed Cemetery with the name, “Ruby Belle Marlow” on her headstone, with the inscription, “Budded on earth to bloom in heaven”. Arnold Marlow died August 30, 1987, and is also buried in the Lougheed Cemetery. (Many thanks to my cousin, Deb Ewanchuk, for the above photo of Dollie Belle. Receiving great photos of people is a definite incentive to research them further and to write about them. Hint, hint to all you gentle readers who may be in possession of such. Also my thanks go out again to Deb and Larry S. for their contribution of Marlow family history material, which has been incorporated into this blogpost).